When revealed, if you have a [Lannister] House card search your deck for a [Baratheon] card. 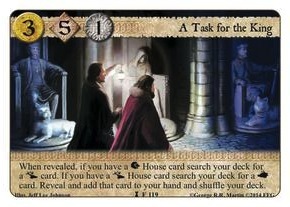 If you have a [Baratheon] House card search your deck for a [Stark] card. Reveal and add that card to your hand and shuffle your deck. Recent Decks: No decks currently use this card.